The core, lowest level logic behind any oref0 implementation of OpenAPS can be found in oref0/lib/determine-basal/determine-basal.js. That code pulls together the required inputs (namely, recent CGM readings, current pump settings, including insulin on board and carbohydrates consumed, and your profile settings) and performs the calculations to make the recommended changes in temp basal rates that OpenAPS could/will enact. OpenAPS follows the same logic that a person with diabetes uses to make dosing decisions. 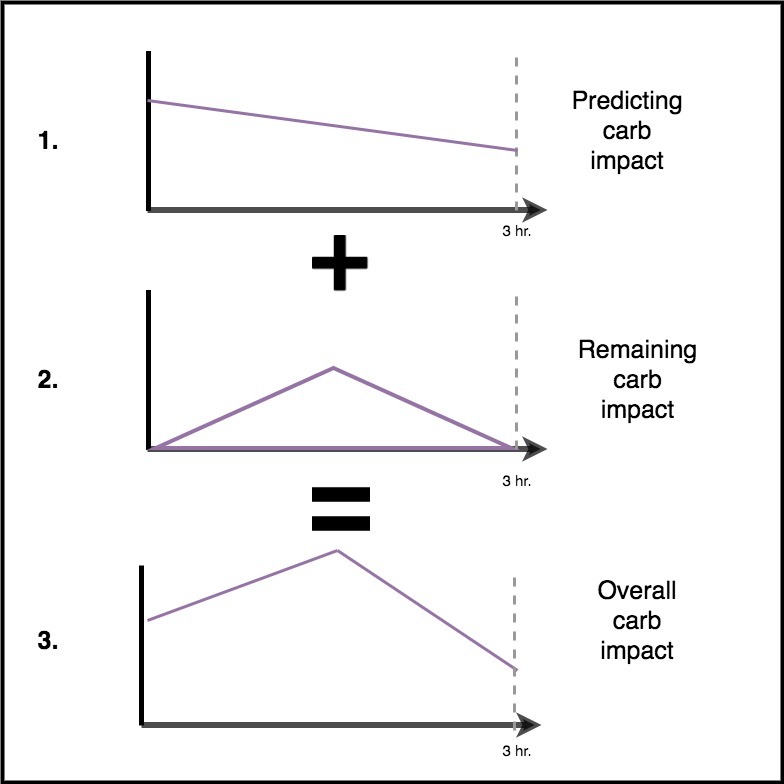 Generally, this means looking at the current BG; subtracting the target; and applying your ISF (correction factor) to determine how much insulin is needed to correct the blood sugar to target. You can subtract any “insulin on board” from the amount needed. You can also add insulin needed to cover carbohydrates. In OpenAPS, we can do both a positive (more insulin) and a negative (less insulin) correction by making adjustments to your underlying basal rates to adjust insulin up or down to help bring the “eventual” BG into target. In OpenAPS, we take the same inputs you would use to manually decide what to do, but we also factor other things into our calculation. iob = Units of Insulin on Board (IOB), net of your pre-programmed basal rates. Net IOB takes all pre-programmed basal, OpenAPS temp basal, and bolus insulin into account. Note: iob can be negative when OpenAPS temp basal rate is below your pre-programmed basal rate (referred to as “low-temping”). This will always be different than pump-calculated IOB, because it only takes into account boluses - ignore pump IOB. This is a high level overview, but you can dive into more detail around how insulin activity is calculated here. basaliob = Units of net basal Insulin on Board (IOB). This value does not include the IOB effects of boluses; just the difference between OpenAPS temp basal rates and your pre-programmed basal rates. As such, this value can be negative when OpenAPS has set a low-temp basal rate. bolusiob = Units of bolus Insulin on Board. Does not take into account any temp basals. BGI (Blood Glucose Impact) = the degree to which BG “should” be rising or falling based on insulin activity alone. minGuardBG, IOBpredG, UAMpredBG = eventual BG predictions based on 1) the lowest your BG is estimated to get over DIA; 2) predictions based on IOB only; and 3) predictions based on current deviations ramping down to zero at the same rate they have been recently. These represent the last entry on the purple prediction lines. Sensitivity Ratio = the ratio of how sensitive or resistant you are. This ratio is calculated by “Autosensitivity” (or “autosens”), and this ratio is applied to both basal and ISF to adjust accordingly. <1.0 = sensitive; >1.0 = resistant. If your preferences allow it, sensitivityRatio can also be modified by temp targets. Target = pulled from your pump target; overridden if you have enacted a temporary target running. You may also see information about settings, either from your pump or from your preferences.json file, that are limiting the insulin dosing decisions that OpenAPS would otherwise make. Make sure to read the preferences page before you set up OpenAPS to understand what settings you have by default, and know how to get back to that page if you ever see a setting displayed in your pill. There is also a handy chart with examples to help you understand how settings may impact the dosing output. After taking into account all of the above, oref0 will put out a recommendation of what needs to be done. This also includes the explanation of the variables above, so you can check and assess if you think it’s doing the right thing. Generally, it will display all of the above values, plus the output of the decision of any temporary basal rates and/or boluses it decides it needs. This is the “reason” field. Temp basals will be displayed with the duration (length of time temp basal will run. A duration of 0 indicates none is running) and rate (units/hr basal rate). You may also see insulinReq, showing how much insulin is needed. This usually displays when OpenAPS is prepping to issue SMB’s (an advanced setting). Once you enable forecast display in your Nightscout configuration, you will be able to see multiple purple line predictions. To do this, click the three dots next to your timeframe horizon (3HR, 6HR, 12HR, 24HR) and then enable “Show OpenAPS Forecasts”. Once enabled, you will have multiple purple line predictions in Nightscout. 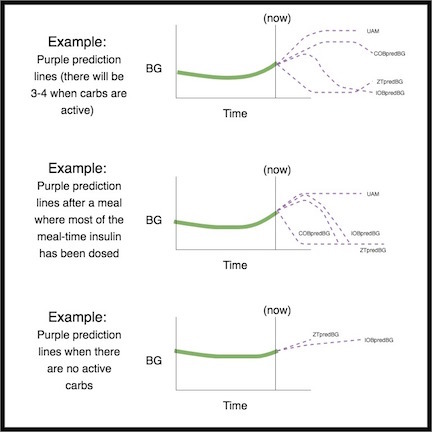 These purple lines show you the different predictions based on current carb absorption; insulin only; (optional feature: unannounced meal/effect detection); and showing how long it will take BG to level off at/above target if deviations suddenly cease and we run a zero temp until then. These purple lines are helpful in understanding, at a glance, why OpenAPS is making the decisions it is, based on your near-term and longer-term BG predictions. In this example, BG is predicted to go low in the near-term, although you are predicted to eventually be above target. However, because the near-term low is actually below the safety threshold, OpenAPS will issue a zero temp, until there is no longer any point of the prediction line that is below threshold. In this example, a near-term prediction shows a dip below target. However, it is not predicted to be below the safety threshold. The eventual BG is above target. Therefore, OpenAPS will restrain from adding any insulin that would contribute to a near-term low (by adding insulin that would make the prediction go below threshold). It will then assess adding insulin to bring the lowest level of the eventual predicted BG down to target, once it is safe to do so. (Depending on your settings and the amount and timing of insulin required, this insulin may be delivered via temp basals or SMB’s). In this example, OpenAPS sees that you are spiking well above your target. However, due to the timing of insulin, you already have enough in your body to bring you into range eventually. In fact, you are predicted to eventually be below target. Therefore, OpenAPS will not provide extra insulin so it will not contribute to a longer-timeframe low. Although you are high/rising, a low temporary basal rate is likely here. For each different situation, the determine-basal output will be slightly different, but it should always provide a reasonable recommendation and list any temp basal that would be needed to start bringing BG back to target. If you are unclear on why it is making a particular recommendation, you can explore further by searching lib/determine-basal/determine-basal.js (the library with the core decision tree logic) for the keywords in the reason field (for example, “setting” in this case would find a line (rT.reason += ", setting " + rate + "U/hr";) matching the output above, and from there you could read up and see what if clauses resulted in making that decision. In this case, it was because (working backwards) if (snoozeBG > profile.min_bg) was false (so we took the else), but if (eventualBG < profile.min_bg) was true (with the explanatory comment to tell you that means “if eventual BG is below target”). If after reading through the code you are still unclear as to why determine-basal made a given decision (or think it may be the wrong decision for the situation), please join the #intend-to-bolus channel on Gitter or another support channel, paste your output and any other context, and we’ll be happy to discuss with you what it was doing and why, and whether that’s the best thing to do in that and similar situations.